Rapid development of molecular genetics has provided ecologists and wildlife managers with a powerful set of tools for studying and monitoring wildlife. We applied these tools to estimate the size of the brown bear population in Slovenia in 2007. In the years after the estimate was made public, we followed how this estimate affected policy and management actions in Slovenian bear management. We designed and executed a large-scale noninvasive genetic sampling across the range of this species in the country with a network of volunteers and estimated the size of the brown bear population in Slovenia using mark-recapture modeling. In a highly intensive 3-month sampling in autumn 2007, we collected 1057 samples. A total of 931 samples were successfully genotyped, yielding 354 different genotypes. Using mark-recapture and correcting for the edge effect caused by bears moving in and out of the sampling area across the Slovenian-Croatian border, and accounting for detected mortality, we estimated “winter” population size (after annual mortality, before reproduction) at 424 (95% confidence interval 383–458). We also observed an uneven male and female ratio of 0.405 and 0.595, respectively. Using “citizen science,” we managed to conduct a highly intensive large-scale sampling with modest financial resources, something that would be impossible to do otherwise. 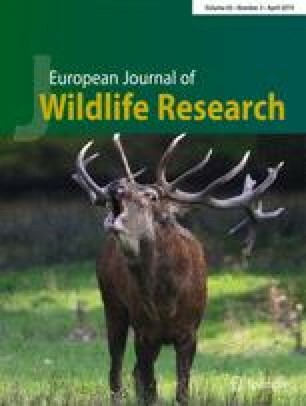 We produced the first robust, scientifically defensible estimate of the brown bear population size in Slovenia. Although at first reluctantly considered by managers as equivalent to other “traditional” population monitoring data, awareness of the importance of the estimate grew with time. It became the first reference point for understanding population dynamics, a basis to which current and future development of the population is being compared to. As such, we can expect it will profoundly affect Slovenian bear management in the years to come. Tomaž Skrbinšek and Roman Luštrik contributed equally to this work. Our first and greatest thanks goes to all volunteers—hunters, foresters, and all other people who love nature and bears and were willing to lend a helping hand for a greater cause. Special thanks go to the Hunters’ Association of Slovenia and the Slovenia Forest Service for their full and unconditional support. We must personally thank Marko Jonozovič and Tone Marinčič for helping us organize the sampling within the Slovenia Forest Service, and Mateja Blažič for the support and encouragement. Another essential person who helped make all this happen and supported us every step of the way was Blaž Krže, to whom we must unfortunately give our thanks posthumously. Last but not the least, we must thank the Slovenian Environment Agency which funded this research. The study was funded by the Slovenian Environment Agency (Project “Analiza medvedov odvzetih iz narave in genetsko-molekularne raziskave populacije medveda v Sloveniji”). The follow-up regarding the effects of the results on management was funded by the Slovenian Research Agency, project J4-7362, and by the European Commission through the project LIFE DINALP BEAR (LIFE13 NAT/SI/000550). All applicable international, national, and/or institutional guidelines for the care and use of animals were followed. Genetic material from bear mortality was obtained according to the annual decree by the Ministry of the Environment of the Republic of Slovenia through the official institution in charge of brown bear monitoring, Slovenia Forest Service. No live animals were handled or harmed for the purpose of this research.